The most important eye exam we ever have is our first one, because it allows an eye doctor to check for normal development and functioning. At what age should you bring your newborn to a local Federal Way optometrist or our 4 other offices? 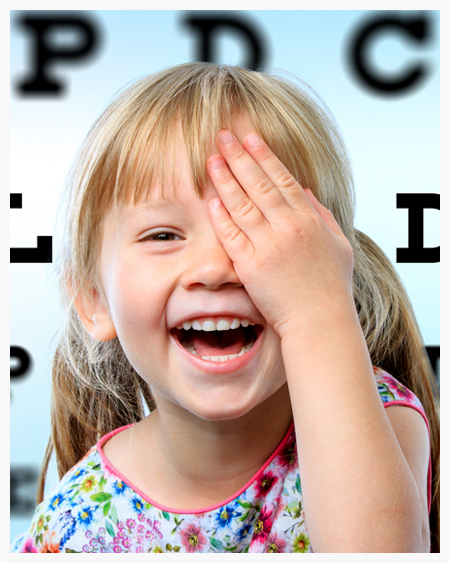 We recommend a complete eye examination at six months of age, or as soon as your child can sit in an exam chair. As a member of the InfantSee Program, along with other optometric physicians across the country, we perform free infant eye screenings for babies under one year of age. Your child does not need to know letters before the first exam, as we are able to find a child’s prescription without them saying a word. Children can’t explain to us how they see, because they have no idea what they’re supposed to see. As with all childhood developmental stages, there are different things we are looking for during the many stages of your child’s growth. According to the American Optometric Association (AOA) children should have their eyes examined by an eye doctor in Federal Way, WA at 6 months, 3 years, at the start of school, and then at least every 2 years following. Since there is a higher risk of eye and vision problems if your infant was born premature or is showing signs of developmental delay, your eye doctor may require more frequent visits to keep watch on his or her progress. A baby’s brain is working diligently to learn how to process the visual information that is coming in. While many motor skills are being developed from the ground up, eyesight is setting the foundation for all interactions with the world. At 6 months we recommend visiting our optometrist so that we can check that the child is seeing properly and developing properly. During they exam we look for conditions that could impair eye health or vision such as strabismus (misalignment or crossing of the eyes), farsightedness, nearsightedness, or astigmatism. During these early years of toddler and preschool development their motor skills, hand-eye coordination and perceptual abilities begin to flourish. Their abilities to read, write, draw, build or play sports is connected in many ways to vision. It is important for parents to be looking out for signs of a lazy eye or crossed eye since there is a higher success rate in treating these conditions when caught early. How do we know what ‘blurry’ is if we’ve never seen clearly? Even children with poor vision think that everyone sees the way they do. Undetected or uncorrected vision problems can cause children and teens to suffer academically, socially, athletically, and personally. If your child has a difficult time with focusing, reading, hand-eye coordination, or headaches they may be experiencing vision problems and not even know it. Proper learning, motor development, reading, and many other skills are dependent upon not only good vision, but also the ability of your eyes to work together. When your eyes are not properly working this can cause your child undue frustration and unhappiness in their understanding of their abilities. Getting your child in to see a pediatric optometrist in Federal Way, WA is an important first step to determine if their problems are visual and if corrective lenses such as glasses or contacts can improve the way they view the world around them.